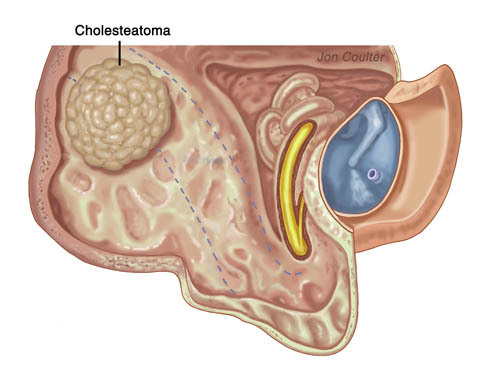 Whenever surgery is performed for cholesteatoma, there are three possible results of surgery, depending on what is found during the operation. If the cholesteatoma is small and can be removed entirely in one piece, the eardrum and the ossicles (bones) are reconstructed all in one operation. If the cholesteatoma can be removed only in pieces, there is always a chance microscopic cholesteatoma fragments left behind may re-grow at a later time. In this case, it is my preference that the patient come back for a second operation several months later to remove any fragments that may have grown over the interval. I would also delay ossicular reconstruction until the second operation. For this reason, the hearing is temporarily reduced significantly during this interval. Infrequently, the cholesteatoma is rather extensive and it becomes necessary to enlarge the ear canal for more complete removal. The bony partition between the back part of the ear canal and the mastoid bone is removed. This is called a canal-down procedure. The eardrum is still preserved or reconstructed. Hearing preservation is still possible. This mastoid cavity requires long term maintenance. Periodic cleaning every 3 to 6 months is required and can be done in the office. A cholesteatoma is seen in a mastoid cavity created by surgery designed to take the canal wall down. Rarely the cholesteatoma is adherent to the inner ear or facial nerve. In this case it is not possible to remove the entire cholesteatoma and a radical mastoidectomy is necessary. The portion of the cholesteatoma that is adherent to the inner ear and/or facial nerve is left. In this case a situation is created where the keratin accumulation can be safely removed in the office. The eardrum, malleus and incus are removed in order to allow exposure of the inner ear and facial nerve for cleaning in the office. Patients usually have a 60 decibel conductive hearing loss. Numbness of the external ear is a natural consequence of an incision behind the ear. Some sensation returns several months later, but return is usually incomplete. Most patients do not find this troublesome. Shortly after surgery, the ear may protrude slightly. The ear almost always returns to normal as the wound behind the ear heals. Risks of the surgery include taste disturbance, facial paralysis, recurrence of cholesteatoma, hearing loss, and dysequilibrium. Temporary taste disturbance, as previously discussed, can be a consequence of chorda tympani nerve (taste nerve) injury. The facial nerve courses through the middle ear on its way to the muscles of the face. Paralysis of the face can occur after ear surgery but is extremely uncommon. There is a general consensus that surgeons who are fellowship-trained in otology/neurotology (as I am) and those who perform ear surgery exclusively (as I do) have a reduced incidence of facial nerve injury. I have performed over 4000 ear operations, and I have never had a patient develop facial weakness or paralysis after such an operation. Temporary disequilibrium can occur from dissection of the cholesteatoma from surrounding structures such as the inner ear and stapes bone. Typically this lasts for one or two days. Even after having surgery, cholesteatoma can recur. For this reason, patients who have had a cholesteatoma surgically treated, and especially those who have had a canal-wall-down procedure, require close follow-up (usually every three months) to detect early recurrence.